These data represent fractional land use and land cover patterns annually for the years 1500 - 2100 for the globe at 0.5-degree (~50-km) spatial resolution. Land use categories of cropland, pasture, primary land, secondary (recovering) land, and urban land, and underlying annual land-use transitions, are included. Annual data on age and biomass density of secondary land, as well as annual wood harvest, are included for each grid cell. 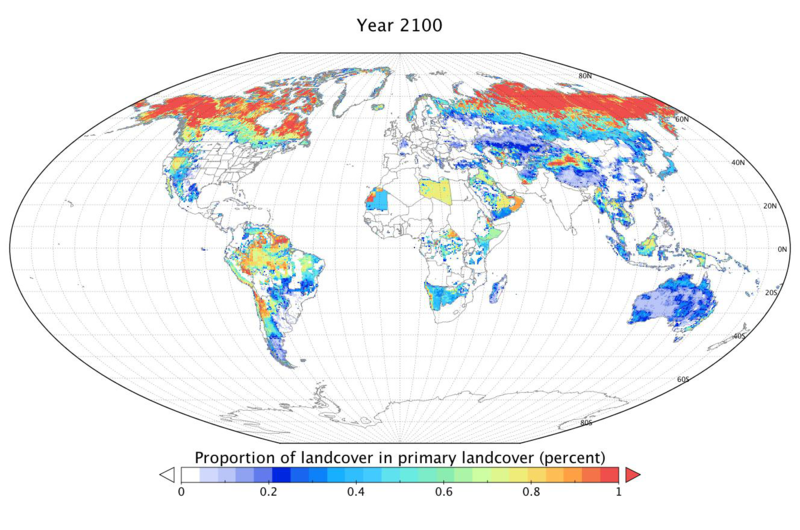 Historical land cover data for the years 1500–2005 are based on HYDE 3.1 and future land cover projections for the period 2006–2100 came from four Integrated Assessment Model (IAM) scenarios which reach different levels of radiative forcing by year 2100: MESSAGE (8.5 W/m2), AIM (6 W/m2), GCAM (4.5 W/m2), and IMAGE (2.6 W/m2). A key feature of these data is that historical reconstructions of land use were harmonized (computationally adjusted to minimize differences at the transition period) with modeled future scenarios, allowing for a seamless examination of historical and future land use. The output data present a single consistent, spatially gridded set of land-use change scenarios for studies of human impacts on the past, present, and future Earth system. For additional information about the algorithms, inputs, and options used in creating the land use transitions data, please refer to Hurtt et al. (2006) and Hurtt et al. (2011). Data are presented as a series of twenty (20) different data products representing different past and future model scenarios. There are a total of 560 NetCDF v4 files (*.nc4), one for each combination of data product and land use variable. Figure 1. 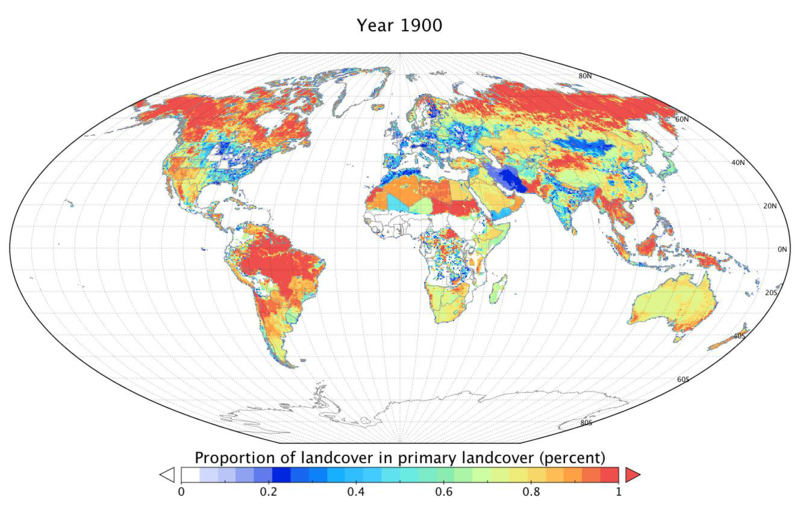 Proportion of landcover in primary landcover in year 1900 and projected to year 2100 under a medium-high emission pathway by the AIM model (from LUHa_u2.v1 and LUHa_u2.v1_aim.v1.1). MsTMIP Model Driver Data http://daac.ornl.gov/cgi-bin/dsviewer.pl?ds_id=1220. An extension of the Harmonized Global Land use that has 47 land cover types is in the MsTMIP Model Driver Data. The MsTMIP data was specifically developed for terrestrial biosphere modeling. In the fifth Assessment Report (AR5) of the Intergovernmental Panel on Climate Change (IPCC), the international community developed new advanced Earth System Models (ESM) to address the combined effects of human activities (e.g. land use and fossil fuel emissions) on the carbon-climate system. In addition, four Representative Concentration Pathways (RCP) scenarios of the future (2005-2100) were provided by four Integrated Assessment Model (IAM) teams to be used as input to the ESMs for future carbon-climate projections. The goal of the Land-use Harmonization project was to prepare a harmonized set of land-use scenarios that smoothly connects historical reconstructions of land-use based on HYDE data, with future projections based on the IAM implementations of the RCPs, in the format required by ESMs. The land-use harmonization strategy estimates fractional land-use patterns and underlying land-use transitions annually for the time period 1500-2100 at 0.5-degree resolution while minimizing differences at the transition between the historical reconstruction ending conditions and IAM initial conditions, and working to preserve the future changes depicted by the IAMs at the grid level. These harmonized data products provide the first consistent set of land-use change and emission scenarios for studies of human impacts on the past and future global carbon-climate system. For additional information about the algorithms, inputs, and options used in creating the land use transitions data, please refer to Hurtt et al. (2006) and Hurtt et al. (2011). The harmonized land use data consists of half-degree gridded historical and future fractional land-use patterns and underlying land-use transitions. The historical data is released as Version 1 of the Land-Use History A product. This release is identical to LUHa.rc2, which underwent an extensive period of review by the scientific community. The historical data uses the HYDE v3.1 historical data set for crop, pasture, and urban area 1500-2005 (aggregated from the original 5 min grids up to half degree grids). The investigators assume that primary land has priority for wood harvest and shifting cultivation except in Eurasia where secondary land has priority. Wood harvest was modeled by country and a new historical wood harvest reconstruction was created based on FAO data (1961-2005), Zon and Sparhwak (1923), and HYDE 3 population data, in a similar fashion to that in Hurtt et al. (2006). The data for future land cover scenarios are currently available for four Integrated Assessment Models (IAMs): IMAGE, AIM, MESSAGE, and MiniCAM (GCAM). Each of the future projections is built off each of the four historical land-use products: LUHa.v1, LUHa_t1.v1, LUHa_u2.v1, LUHa_u2t1.v1, for a total of 16 different future land use products. Algorithms for computing the future land cover and land use transitions are similar to those for the historical products and further details can be found in Hurtt et al. (2006). In addition, the harmonization algorithms ensure a continuous transition of land-use states in the harmonization year (2005) and provide gridding of the regional IAM data when needed. Data are presented as a series of twenty (20) different data products representing different past and future model scenarios (Table 1). There are a total of 560 NetCDF v4 files (*.nc4), one for each combination of data product and land use variable. The 32 different land cover types, land use transitions, secondary land characteristics, and detailed wood-harvest information provided in both historical and future data products are listed in Table 2 below. Table 1. The Land Use Harmonization project has produced twenty data products representing different combinations of past and future scenarios. Each product contains 24 (or 32 for scenarios that include urban land) NetCDF files with annual data for a specified range of past or present years. In both the historical and future data, shifting cultivation is assumed to occur only in some locations of the world, which are given in the companion shifting cultivation map shiftcult_map_halfdeg.txt which was taken from J.H. Butler's "Economic Geography" (1980). The investigators assumed that the ice or water fraction of each gridcell is constant throughout time (see gicew.1700.txt). A grid giving the locations assumed to be potential forest is provided in the file fnf_map.txt. To view and use the full time series you will need to download both the historical product (such as LUHa.v1) as well as one or more future land use data product (LUHa.v1_model). For more information see the project website at http://luh.umd.edu/. Table 2. Land cover types, land use transitions, secondary land characteristics, and wood harvest data fields included in the data archive. Note that urban land use and transitions are only included in the data products that involve urban land. Grid cells at 0.5 x 0.5-degree resolution (~50-km). Historical data for years 1500 – 2005, Future projections: 2006—2100. Data files in this data set archive are named following the convention: “product_variable.nc4”, where the products are twenty different temporal scenarios (from Table 1) and the variables are thirty-two different land cover types, secondary land characteristics, wood harvest variables, or land cover transitions (from Table 2). The diversity of approaches and requirements among Integrated Assessment Models (IAMs) and Earth System Models (ESMs) for tracking land use change, along with the dependence of model projections on land use history, presents a challenge for effectively passing data between these communities and for smoothly transitioning from the historical estimates to future projections. This harmonized set of land use scenarios smoothly connects historical reconstructions of land use with future projections, in the format required by ESMs, providing an important resource for studies of human impacts on the past, present, and future Earth system. Sensitivity analyses were a key feature of this study, and were designed to quantify the importance of model inputs, attributes, and assumptions on results. To evaluate sensitivity, global land use cases were paired in which only a single factor (such as simulation start date, or wood harvesting) was changed, and the differences between them were calculated for six output metrics: total gross land-use transitions from the starting year to 2100, total net land-use transitions to 2100, global area of secondary land in 2100, global mean age of secondary land in 2100, cumulative loss of above-ground biomass carbon to 2100, and cumulative net loss in above-ground biomass carbon to 2100 (illustrated in Hurtt et al. 2011, Fig. 8). Key findings from these analyses indicated that shifting cultivation, wood harvesting, and simulation start date all strongly affect estimated secondary land area, secondary land age, and carbon fluxes. For example, averaged across all RCPs, omitting shifting cultivation reduced mean secondary area in 2100 by an average of 13%, omitting wood harvest reduced secondary area by an average of 57%. Excluding both processes and starting the simulation in 2005 reduced secondary area in 2100 by 84%. Not surprisingly, omitting these factors also translated into large estimated carbon flux differences: 36–78% (300–660 Pg C) cumulative, and 8–34% (20–88 Pg C) net. For most metrics, the choice of RCP, while important, had a smaller impact than the inclusion of wood harvest, shifting cultivation and choice of start date. The main exception to this was in the cumulative net losses from above ground biomass, in which the policies that valued carbon from biomass in RCP4.5-GCAM resulted in losses from wood harvest etc. being largely offset by carbon gains on other lands. While the approach taken to generate this data relied on using an ambitious combination of multiple model inputs and other model factors, these results must be considered uncertain and highly dependent on the inputs and assumptions used, as the sensitivity analyses illustrated. Overall, uncertainty is expected to be highest in the distant past and future, and at high spatial resolutions. The Global Land-use Model (GLM) (Hurtt et al. 2006) was adapted and extended to generate a harmonized set of global gridded land-use change scenarios for the period 1500–2100. GLM computes land-use patterns and sub-grid cell land-use transitions using an accounting-based method that tracks the state of the land surface in each half-degree grid cell, annually, as a function of the land surface at the previous time-step. For the years 1500–2005, land-use (cropland, pasture, urban, and ice/water) was based on the HYDE model. The HYDE database v3.1 (Klein Goldewijk et al. 2010; Klein Goldewijk et al. 2011) contained gridded time series of historical population and land-use data for the Holocene. A subset of HYDE 3.1 was used to provide global gridded crop, pasture, ice/water, and urban land area at 5-minute resolution every 10 years from 1500 to 2000, and in 2005. These data were aggregated to 0.5-degree resolution, and converted from absolute area of each grid cell to grid cell fractional area. They were then linearly interpolated in time to produce annual maps for each 0.5-degree grid cell. The ice and water fractions of each grid cell were assumed constant over time. By subtracting the land-use and ice and water fractions from each grid cell, the fractions of each grid cell occupied by natural vegetation (either primary or secondary) were also determined. For 1961–2005, FAO national wood harvest volume data were used for both coniferous and non-coniferous round wood, along with wood harvest density values of 0.225 Mg C/ m3 for coniferous wood and 0.325 Mg C/ m3 for non-coniferous wood (Houghton and Hackler 2000) to convert these statistics to weight of carbon harvested. For years prior to 1961, annual national wood harvest statistics were estimated by multiplying the national per capita wood harvest rate by the national population. National population was derived from the HYDE population data. To convert quantities of harvested wood into areas of impacted land, and to discriminate forested land from non-forested land for wood harvest activities, information was needed on the historical distribution of above-ground C stocks and forest extent, and on their recovery following wood harvest and land-use abandonment. Estimates of ecosystem properties were based on a global extension of the Miami-LU ecosystem model (Hurtt et al. 2002). Miami-LU was run globally at 0.5-degree resolution for a spin-up period of 1000 years using average climate data from the ISLSCP-I data set (Meeson et al. 1995; Sellers et al. 1995). To differentiate forest from non-forest areas, a definition based on the aboveground standing stock of natural cover of at least 2 kg C/ m2 was used (Hurtt et al. 2006). Each grid cell was thus identified as potential forest or non-forest based on potential biomass. Finally, Miami-LU was also used to estimate the recovery of carbon stocks on secondary lands, in order to determine the amount of secondary forest carbon available for wood harvest each year. The application used here tracked the mean age of secondary land, and did not account explicitly for the complete age distribution within secondary lands, or the potential effects of land degradation, climate variability, forest management, fire management, or pollution that may have occurred. For 2006–2100, land-use and wood harvest information were based on four different Representative Concentration Pathways (RCPs) derived from four different Integrated Assessment Models. MESSAGE: RCP8.5 was an emissions pathway which reaches a radiative forcing of 8.5 W/m2 and rising in 2100. RCP8.5 was simulated in a structure of interlinked disciplinary and sectorial models referred to as the IIASA Integrated Assessment (IA) Modeling Framework (Riahi et al. 2007). Within the framework, consistency of land-cover changes (urban areas, cropland, and forest areas) was achieved through the exchange of spatially explicit information between the world food system model (AEZ–WFS) and the forest management model (DIMA), which were linked to the MESSAGE energy system model. AIM: RCP6 was a med-high emission pathway with mitigation actions taken late in the century to stabilize radiative forcing at 6 W/m2 after 2100 without ever exceeding that level. RCP6 was simulated using the AIM (Asia-Pacific Integrated Model) and other models developed at the National Institute for Environmental Studies (NIES) in Japan. GCAM: RCP4.5 was a low stabilization scenario that stabilized radiative forcing at 4.5 W/m2 (~650 ppm CO2-equivalent) before 2100 without ever exceeding that value. RCP4.5 was simulated with the Global Change Assessment Model (GCAM; formerly MiniCAM), based on scenarios in Clarke et al. (2007). IMAGE: RCP2.6 (also referred to as RCP3PD) represented a very low emission scenario and explores the feasibility of limiting climate change to less than 2°C by limiting radiative forcing to a peak of 3 W/m2 in mid-century, declining to 2.6 W/m2 in 2100. The underlying scenario was simulated with the IMAGE model (van Vuuren et al. 2011b). For methodological details about the algorithms, inputs, and options used in creating the land use transitions data, please refer to Hurtt et al. (2006) and Hurtt et al. (2011). Butler, J.H. 1980. Economic Geography: Spatial and Environmental Aspects of Economic Activity. John Wiley, New York. Clarke L., J. Edmonds, H. Jacoby, H. Pitcher, J. Reilly, R. Richels. 2007. CCSP Synthesis and Assessment Product 2.1, Part A: Scenarios of Greenhouse Gas Emissions and Atmospheric Concentrations. U.S. Government Printing Office. Washington, DC. Klein Goldewijk K., A. Beusen, G. van Drecht, M. de Vos. 2011. The HYDE 3.1 spatially explicit database of human induced land use change over the past 12,000 years. Global Ecol Biogeogr 20:73–86. Doi:10.1111/j.1466-8238.2010.00587.x. Zon R., W.N. Sparhawk. 1923. Forest Resources of the World, Volume I. McGraw-Hill, NY.